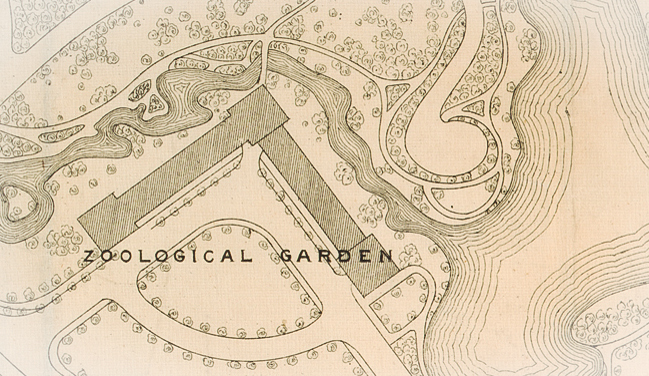 As seen in this planning document, a zoo had also been planned for Chicago’s Garfield Park. According to Chicago Park District historian Julia Bachrach, park districts balked at the high cost of operating neighborhood zoos, especially after Lincoln Park Zoo proved so successful. Our question comes from John Lillig, a resident of the West Ridge neighborhood on Chicago’s far North Side. The location is important to this story in that he’s intimately familiar with the nearby Indian Boundary Park. It&apos;s a place, he says, where he once could take his child to visit a tiny zoo that housed a llama, a bear, and other animals. In recent years, the zoo comprised a goat, a handful of chickens and some ducks. With the rumored closing of the Indian Boundary Park zoo, I was wondering about the history of that unusual neighborhood zoo and wondering what other zoos may have existed in Chicago other than Lincoln Park Zoo (or Brookfield Zoo). I have heard that Indian Boundary Zoo is the only remaining neighborhood zoo of what were once several neighborhood zoos. Is this true? What other zoos have existed in Chicago, where were they located, and what is there now? As there had been a lot of coverage of Indian Boundary this year, we took on the latter half of his question. It’s a good thing, too, since the answer required some digging. Thankfully, John was able to provide a solid lead. He once taught literature classes, he says, and would use the AIA Guide to Chicago as source material. He noticed that the entry on Indian Boundary Park mentioned that it was the only remaining neighborhood zoo, which suggested there had once been others. Several experts we consulted — including some who contributed to the AIA guide — didn’t know of of any other neighborhood zoos. But, it turns out, there had been one. Chicago Park District historian Julia Bachrach directed us to Union Park, located at 1501 W. Randolph St.
We met Bachrach there, against the backdrop of kids playing on the playground and people jogging. During a short tour, she explained what the park was like in the late 1800s, and how, like many American parks at that time, it had a zoo or, more accurately, a menagerie. So, with Bachrach’s good graces, and help from the Chicago Park District, the Chicago History Museum and the ghost of an urban bear, we produced this video profile of the West Side’s long-forgotten zoo. Image credits: Thanks to the Chicago Park District for permission to film at Union Park and for access to historical images posted in the facility’s field house. Katie Kather is an arts and culture reporting intern at WBEZ. Follow her @ktkather. Shawn Allee edits Curious City, which you can follow @WBEZCuriousCity.